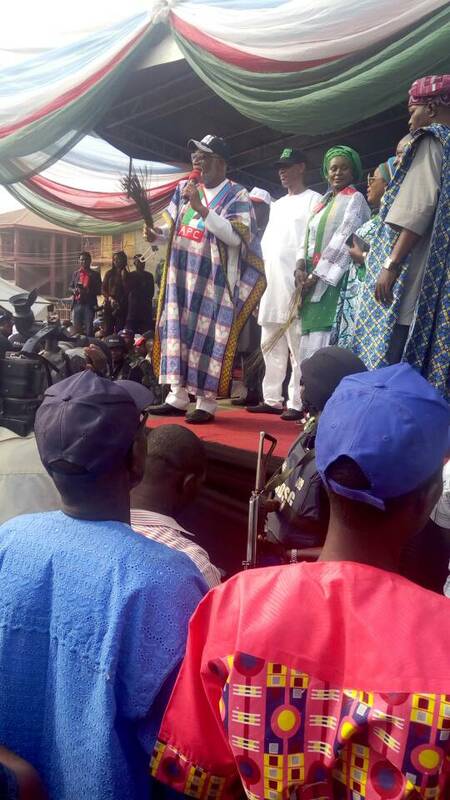 The governorship candidate of the Alliance for Democracy (AD) in the 2016 gubernatorial election in Ondo State, Chief Olusola Oke, SAN, has returned to the All Progressives Congress (APC). Oke was received into the APC by the acting Chairman, Engr Ade Adetimehin and Governor Oluwarotimi Akeredolu, SAN. The former National legal adviser of the Peoples Democratic Party (PDP) left the APC after the September 3rd, primary election. Oke hinged his exit from the APC on an alleged irregularities in the primary election which produced Akeredolu as the party flagbearer. But, the acting Chairman of the party, Adetimehin said the primary election was free, fair and credible. While addressing defectors, the APC Chairman said “Permit me to state categorically here that the historic primary election that returned the incumbent Governor of the state as the APC gubernatorial candidate was free, fair and credible. “It was keenly contested and there was no doctored list of delegates to favor the winner nor voting by non – accredited or fictitious delegates as espoused by some divides of the party after the primaries. “The widely publicized and orchestrated rumor of foul play during the exercise were mere fabrications, distortion of fact and figment of imagination of some overzealous supporters and agents of destabilization who were pursing selfish agenda”. Adetimehin stressed that the crisis and anti-party activities that followed the primary election was as a result of cluelessness and indiscipline of the former leadership of the party. The acting Chairman blamed the former leadership of compromising the situation to degenerate into an absurdity. He vowed that the current party leaders will never allow political recklessness to occur in the APC again. Adetimehin applauded the National leadership of the party for building bridges and filling the gaps so as to build a strong and virile party in the state. Governor Akeredolu said there was room for everyone to come back to the party, adding that anyone who expressed willingness to come will be embraced. “We are supposed to be clay, nobody can do it alone, the position we are today is by the grace of God. We don’t know how to do it, don’t let anybody boast, it just pleases God. “We should forget about the past because there is no how we will not offend each other if we are aspiring for the same position but we have resolved our difference”. Oke said he had led his followers into the party to reload the APC, adding that he was ready to give total loyalty to the party. Other defectors at the event included, the governorship candidate of the Democratic Peoples Party (DPP) in the 2016 governorship election, Olamide Falana, Oke’s running mate, Ganny Daudu, Temidayo Orunmoluyi, Jenyo Ataunko, among others.